Can Israel Learn How to Make Its Case? 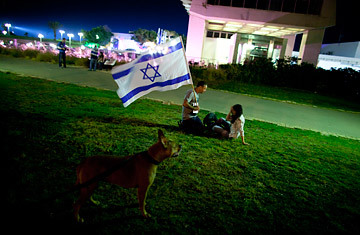 After the Mavi Marmara incident, Israelis demonstrate in front of the Turkish embassy in Tel Aviv. As the only Israeli lawmaker aboard a vessel steaming toward an Israeli blockade, Hanin Zoabi spent a fair amount of her time on the Mavi Marmara talking to the media. Or trying to. The Turks understood only Turkish, and a good many of the Arab reporters were flummoxed by what they found before them. A petite, apparently sane Palestinian woman serving in Israel's parliament had no place in the story they had been telling one another for decades. "The Arabs didn't understand why I am in the Knesset," says Zoabi, 41. "They didn't of course like the fact that I am giving legitimization to Israel. I sent a message to the whole world that Israel is a democracy." Zoabi was below decks when her country's commandos descended to the Mavi Marmara, found themselves in over their heads and opened fire, killing nine civilians. But she saw her share of action back in the Knesset, which as a representative body had absorbed the events at sea with all the equanimity and quiet self-reflection of the Israeli public at large. Which is to say, not much. "Traitor!" colleagues cried when Zoabi returned to the Knesset. "Terrorist!" By the time she left, with a phalanx of brand-new bodyguards, a record 14 lawmakers had been ejected. "We need to make sure she isn't carrying a knife! She's a terrorist," one hollered on his way out. Speaker Reuven Rivlin had a sage reminder for those who remained. "We are a democratic state," he said. "And the entire future of our country is contingent upon what happens here." That sentiment comes pretty close to summing up the Marmara affair as it was understood by much of the globe and a few worldly Israelis. Besides fracturing the Jewish state's relations with Turkey, its most important Muslim ally, and undermining a nascent rapprochement with the Obama Administration in Washington, its most important ally of all, the flotilla fiasco also invited fresh judgment of the kind of democracy Israel has become: a conspicuously belligerent one, reflexively disposed toward the military option whatever the problem at hand  and apt to look bad doing it. The name-calling comes later. "The qualities that once typified Israel and its leadership  freshness, originality, creativity"  have not been in evidence for some time, lamented David Grossman, the country's leading novelist. In their stead: "Clumsy and calcified policy, which again and again resorts by default to the use of massive and exaggerated force, at every decisive juncture, where wisdom and sensitivity and creative thinking are called for instead." Given those instincts, Grossman wrote in the Guardian, the Turks spoiling for a fight on the top deck of the Marmara had an advantage in the knowledge that "Israel is destined and compelled, like a puppet on a string, to react the way it did." In large measure, however, this is not the story Israel was telling itself. Much more typical was a headline in Israel's largest daily, Yedioth Ahronoth: "The world is attacking, we are saluting." The population overwhelmingly embraced the elite team that fast-roped to the boat. On a Tel Aviv billboard, a message in English hailing the navy SEALS is barely legible under the messages spray-painted a hundred times in Hebrew: "Well done." "There's the way we see it, and there's a way it's being shown to the world," says Hatsav Arad, 32, a computer engineer sitting down to breakfast at the end of a brutal week. The way Israelis see it, the failure of the commando mission was compounded by a failure to communicate the danger in which Israel finds itself. The Gaza Strip, besides being home to 1.5 million overwhelmingly poor Palestinians, serves as a launching pad for missiles usually fired by Hamas, the fundamentalist Islamic group that does not shy away from terrorist attacks. The Qassam rockets that reach nearby Israeli towns are cobbled together inside Gaza. The fear is that Hamas will one day be able to stockpile larger rockets that could reach Tel Aviv. These would likely be supplied by Iran and arrive by ship. Hence the blockade. "The idea that you could have cargo going directly from the Mediterranean to Gaza is a direct security threat to Israel," says Mark Regev, a government spokesman. But Israel also controls the flow of goods into Gaza by land and forbids not just weapons but also the smallest of luxuries (coriander, for instance) in hopes, presumably, that Gazans will blame Hamas for the blandness of their soup. As a tactic, this has done little to animate the image of Israel as victim but a good deal to promote the notion of Gaza as worthy of relief, perhaps by flotilla. "This is totally the opposite from how we see it," says Shaul Goldstein, mayor of the Gush Etzion settlement bloc south of Jerusalem. "Nobody will listen to us." Which only makes everything worse. "On the one hand, there's an automatic reaction to criticism from the world, which is the Holocaust syndrome of collective victimhood, a kind of posttraumatic mental condition," argues Yaron Ezrahi, a political scientist at Hebrew University. To that special sensitivity add the posture of a right-wing government elected partly in reaction to world criticism of Israel's Gaza offensive that began in late 2008, the inflammatory rhetoric of Turkish Prime Minister Recep Tayyip Erdogan and a few words from veteran White House correspondent Helen Thomas to the effect that Israelis should return to Poland and Germany. "It's almost like a chain reaction," Ezrahi says. "It gets worse and worse." See pictures of life under Hamas in Gaza.